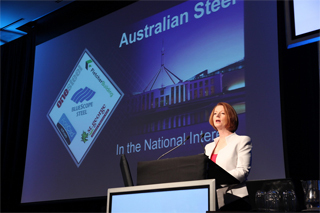 Last month STRUMIS LTD was privileged to take part in the annual Australian Steel Institute’s (ASI) conference. Following immediately after Julia Gillard, the Australian Prime Minister’s opening remarks, Executive Director of STRUMIS LTD, Mr Richard Brotherton presented a session titled; Impact of Innovation through BIM on Project Efficiencies and Documentation. This exciting opportunity enabled STRUMIS LTD to present its BIM vision for the structural steelwork supply chain. Emphasizing the progression in software interoperability, and the benefits that are practically possible through BIM for the structural steelwork supply chain and in particular for the fabricator, Mr Brotherton outlined the route through which return on investment, and substantially reduced costs are made possible through STRUMIS LTD’s Fabrication Information Modeling (FIM) approach. Mr Brotherton commented, "I was delighted to present at this prestigious event and to focus on BIM and how benefits can be realized for our clients in the structural steelwork supply chain. STRUMIS LTD's products are practical tools that enable interoperability and BIM for the construction industry as a whole whilst delivering real competitive advantages for those involved in the delivery of structural steelwork." FIM is STRUMIS LTD’s trademark methodology for the steelwork supply chain that harnesses the workflows between Engineering, Fabrication and Construction companies through open, best practice solutions and standards based integration including CIS/2 and IFC. Working in association with a BIM based project significant cost savings in steelwork production and construction can be realized much earlier in the design phase, in conjunction with other engineering disciplines.